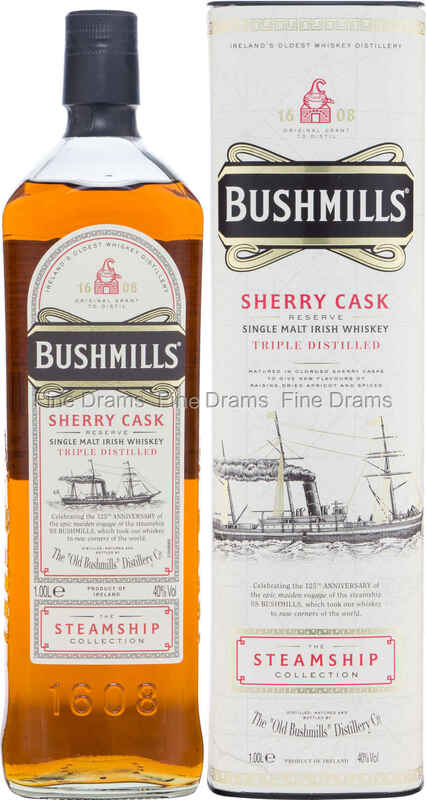 Bushmills first release as part of the new Steamship collection, which pays homage to the voyage of the SS Bushmills in the 1890s. At the time, the owners of the distillery were the Boyd Brothers, and the steamship sailed as far as Philadelphia and Yokohama, coming back to Ireland with a wealth of different cask varieties, including Bourbon and fortified wine. Fittingly this collection was designed for the travel retail market, though a few bottles have made it on to our shelves. This bottling takes Bushmills classic triple distilled whiskey and matures it exclusively in Oloroso Sherry casks, with notes of baking spices, dark chocolate, dried fruit and sweet wine. Colum Egan, Bushmills Master Distiller stated that: “For centuries distillers have experimented with different barrels so naturally I was inspired by the adventures of the ship and the opportunities it opened to experiment with various casks from around the world.” A truly fantastic new offering from Bushmills, which packs in plenty of flavour.